In the 1980s Comiskey Park was not faring well. 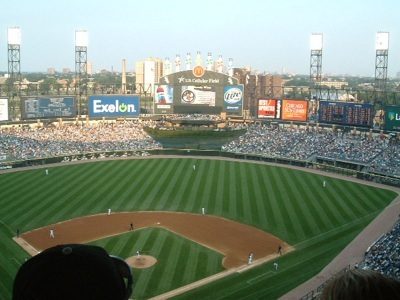 The White Sox had been sold by Bill Veeck to Jerry Reinsdorf and Eddie Einhorn in 1980, and even though new plastic seats, a new Diamond Vision video board, luxury suites, and improved office facilities had been added to the park it was still the oldest park in baseball and was slowly falling apart. Some structural engineers declared the park would not be usable by 1990. The White Sox at first had plans to build a new park in the Chicago suburb of Addison, Illinois, and even had purchased a 140-acre site and drawn up blueprints for the new stadium. The team and owners really wanted to get out of the South Side. "It would be part of white flight, but that isn't the reason for the move," said Reinsdorf at the time of the proposed Addison move. "The fans moved away from the South Side. Why can't we?" The voters of Addison narrowly turned down the resolution that would have allowed the Sox to build their park in the suburbs, however. Tired of paying for the cost of upkeeping Comiskey Park, and greedily wishing for more valuable luxury suites, Jerry Reinsdorf issued an ultimatum to the city of Chicago in 1988: build a new ballpark or the White Sox would move to Florida. Reinsdorf's threat was not without basis for St. Petersburg, Florida was beginning work on a baseball stadium hoping to lure a team dissatisfied with their current situation, like the White Sox, to St. Pete. Chicago knew this, but politicians in the state of Illinois had to approve the building of a new stadium for the White Sox, and this would be a tough task as the majority of them were Cubs or Cardinals fans. The death of Chicago mayor Harold Washington, who had supported a new stadium for the Sox, meant there was not a major voice of importance supporting the issue from the city so leadership came from Illinois governor Jim Thompson. 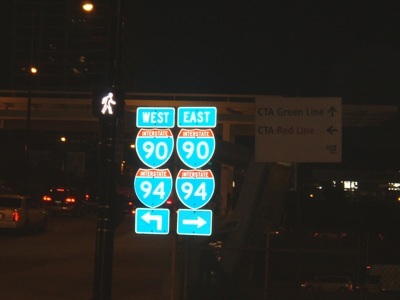 Thompson and the city had agreed to build a new stadium with the understanding that it would be built next to the current Comiskey Park and it would be jointly controlled by the city and the White Sox, but it did not look like the bill would have the votes needed in the Illinois legislature, and if the bill was not passed by midnight on June 30th of 1988 it would then require a 3/5ths majority to pass, which would be nearly impossible since the spending bill was having trouble securing a simple majority. Things were not looking good for the White Sox, and construction of the Florida Suncoast Dome was speeding up in anticipation of a 1989 opening while fans in Florida began purchasing "Florida White Sox" T-shirts. Two groups were formed to try and save the Sox. Chicago's Loop to Save the Sox and Sox Fans on Deck both tried to keep the Sox in Chicago, but the groups were small and underfunded which led to them being largely ignored by the politicians. Governor Jim Thompson was the only hope for Chicago White Sox fans. On June 29th Thompson secured an agreement between the Sox and the city of Chicago for a new park to be built on the corner of 35th and Shields. Governor Thompson, along with busloads of Sox fans, left Chicago for Springfield where the fight would be brought to the Senate floor. Thompson knew the White Sox stadium bill could not pass on its own, so he had the building of a new grandstand at the suburban Arlington Park racetrack added to the bill. The original grandstand at the popular suburban park had burned down in 1985, and there were no definite plans for a new one. This addition to the bill would bring some suburban congressmen aboard, but a lot of work still needed to be done for it to pass. Thompson led a public rally outside of the Senate with the legions of Sox fans who showed up in Springfield, and then he went to work behind closed doors to convince every state legislator that owed him a favor to vote for the bill. After a few minor changes to the bill, including assurances that a minority contractor would build the stadium, the bill passed the Illinois Senate at 11:35 pm with the minimum required votes. The battle now moved on to the House where Thompson applied more pressure, and probably did a little horse trading, to try and get the bill passed. At 11:59 a few more votes were still needed, but House Speaker Michael Madigan could count and he knew the measure couldn't pass yet. He made it clear to the keeper of the gavel that the session would not end until he wanted it to. Officially at 11:59 pm on June 30th a vote was taken and the bill passed. Although the watches of everyone in Congress read 12:03, it was the clock of the keeper of the gavel that counted, and no judge in Illinois would dare stick their nose into the affairs of the state legislature. The bill became known as the 12:03 Miracle, and the White Sox were to remain in Chicago. On May 7, 1989 ground was broken for the new Comiskey Park across the street from where the cornerstone had been laid for the original Comiskey 79 years previously. The park was to be the first new baseball-only stadium built in the American League since 1973, and it would set an example, in both what it did right and what it did wrong, for more new parks to follow. Governor Thompson threw out the first pitch on Opening Day of 1991, and in its first year Comiskey Park set a White Sox attendance record drawing 2,934,154 fans. In place of the oldest park in baseball the White Sox now had the most high-tech stadium in baseball. The stadium included 90 luxury skyboxes, a spacious clubhouse for the players, and unobstructed views. The park did try and keep some of the charm of the original Comiskey, however. The arched windows of the new Comiskey mimicked the old brick archways of the old park, the concrete exterior was a similar color as the original, and the infield dirt was brought over from the old Comiskey. Comiskey's famous exploding scoreboard, which lit up and shot off fireworks after a White Sox home run or win, was also replicated in the new park, although on a smaller scale. While the park was praised when it was first opened people began to wonder why it didn't have the traditional baseball feel of older parks. This criticism became harsher when Oriole Park at Camden Yards opened and successfully blended the traditional baseball feel with modern amenities. 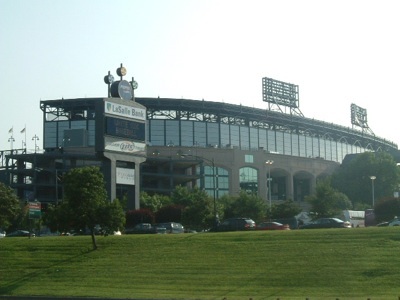 In January of 2003 the White Sox announced they had reached an agreement with wireless service provider U.S. Cellular to rename the ballpark U.S. Cellular Field. The 23-year deal is set to pay the White Sox $68 million over 20 years. They used the money immediately to improve the park that was to be host to the 2003 All-Star Game, the first All-Star Game in which the winning league would have home-field advantage for the World Series. The White Sox installed a new high-resolution video board in center field that had HDTV and widescreen capabilities. They also installed two LED ribbon boards along the upper decks and made improvements to the upper deck that lessened the steep incline while decreasing the number of seats. The biggest change was the installation of a fan deck on the center field concourse which provided a patio-like atmosphere giving fans a view of the action on the field from a vantage point above the batter's eye. 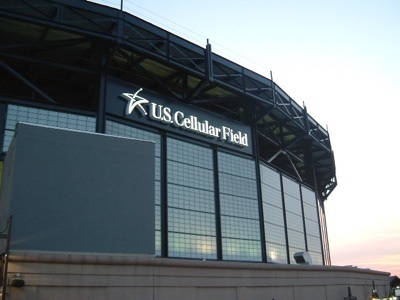 A few other minor changes in 2004 and 2005 helped make U.S. Cellular much more fan-friendly, although it still kept the slightly divisive nickname of "The Cell" amongst fans. Since Guaranteed Rate Field is all by itself on the South Side of Chicago there is plenty of parking around the stadium (+1), and it is easy to get there taking the Dan Ryan Expressway (+1). You can also take the Red Line of the El (+1) that, just like the stop at Wrigley Field, will drop you off considerably close to the stadium (+1). Maybe the only problem at U.S. Cellular is that there isn't the overabundance of cabs that there are around Wrigley so getting out could be tougher unless you plan to drive or take the El out. Who would seriously take a cab when other forms of transportation are so readily accessible, though? The tickets at U.S. Cellular aren't too unreasonable, but the Sox unfortunately followed the Cubs' lead of instituting different prices for different games (-1). The Sox go a step further by charging nearly twice as much for the three games against the Cubs (-1). Pretty good seats can be had for around $35 for "Regular Games" (+1). Box seats max out at around $67 for "Premier Games" so they aren't as bad as other stadiums. Some of the best seats are only available as season tickets, a policy the White Sox started after their World Series victory, which is slightly annoying. The upper deck can be as cheap as $11.50 on Mondays (+1), but there is a reason those seats are so inexpensive. Despite the White Sox attempts to improve the slope of the upper deck you still may find yourself trying to overcome a case of vertigo as you ascend the steps of Mt. Guaranteed Rate (-1). Seats in the upper deck are far away from the field so you won't feel as close to the action as you do in the portions of the park that are not within the stratosphere. It isn't as bad as RFK Stadium, though, and other than the upper deck the rest of the park offers decent views of the action with no obstructed seats because of the design of the upper deck (+1). I'd rather have a few obstructed seats than an upper deck so far away from the action, but I've never had to sit in an obstructed seat so maybe I shouldn't say anything. The outside of U.S. Cellular is pretty much a giant wall of concrete (-1). It doesn't have the quaintness that the arch design of the old Comiskey Park. They tried to emulate the old design, but there is still way more concrete than glass. There is really nothing outside the stadium to take away from the concrete other than a wall containing portraits of a few famous Sox and some bland windows. The main entrance breaks things up a little, but not enough to prevent U.S. Cellular from looking extremely sterile from the outside. The one point of interest on the outside is sadly located in a parking lot across from U.S. Cellular. 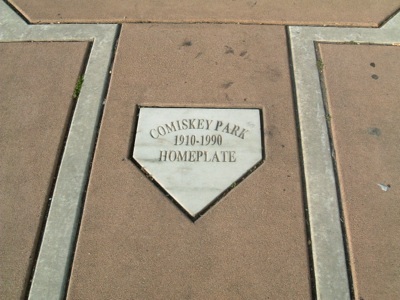 Easily missed among the cars is a small marble home plate in the location of the original home plate from Comiskey Park (+1). The foul lines even run from the plate through the parking lot it is hidden in. Despite the steepness of the upper deck U.S. Cellular Field is pretty nice on the inside, and improved even more after the 2003 renovations. The lower concourse is uniquely designed so you always have a view of the game as you walk around it which started a trend with modern and retro classic parks in the majors (+1). The center field concourse is accented with old-fashioned lamps installed above the aisles that make it look really nice (+1). The fan deck in center field is a good place to watch the game for an inning or two if you feel like it (+1). There are also some areas where you can clock your fastball, I peaked at 68 mph, and baseball clinics are regularly held before games. Although you don't have the best view of Chicago from U.S. Cellular as most of the views around the park are of the nearby expressway, you can get a great view of the skyline of downtown Chicago from the upper deck concourse just off left field (+1). You can't really watch the game from the outer concourse, however, so don't expect to ever have a good view of Chicago and a good view of the action on the field. This is the only problem with the inside of U.S. Cellular Field in that you cannot see outside the stadium from your seats except for the ugly, run-down buildings that can be seen behind the scoreboard. A view of downtown Chicago would have been nicer. In 1960 Bill Veeck conceived and had installed his "exploding scoreboard" at the original Comiskey Park. The scoreboard featured 10 spinning pinwheels, sound effects, and fireworks that went off after a White Sox home run or victory (+1). The new scoreboard isn't nearly as impressive as it is much smaller and has 3 fewer pinwheels, but the video board is breathtaking since it was updated before the 2003 season (+1). It is the most clear video board I have seen in a ballpark, even if it may not have been worth whoring out the name of the stadium for. The board does show just about every stat you could ask for, though (+1). 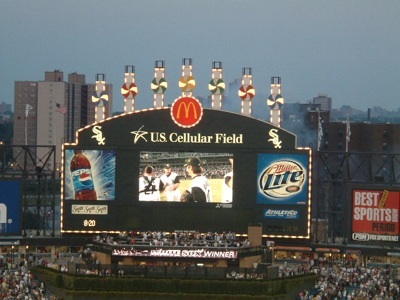 The Sox also added a new out-of-town scoreboard in 2009 that shows more stats about each game (+1), but only shows four games at a time instead of every game in baseball (-1). The White Sox have skill challenges such as speed pitch (+1), running the bases (+1), and batting cages (+1), but there isn't anything for younger kids (-1). Even though they don't always turn out for games (-1), White Sox fans are pretty knowledgeable (+1). Just like the fans across town it isn't uncommon to see fans up in their seats in the early innings (+1), and you can talk to just about anyone and they will have a good amount of knowledge of the game (+1). 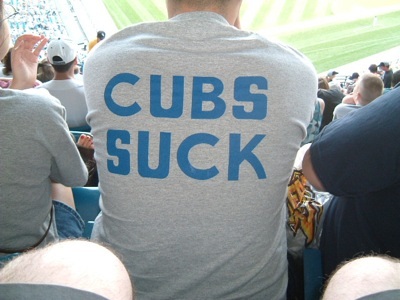 They aren't always the nicest when you show up to the game wearing a Cubs' jersey, but whose fault is that? The ushers at Guaranteed Rate are certainly not the nicest in baseball. They are generally pretty unfriendly, and after a game they will usher you out as quickly as possible (-1). One game I went to had a fireworks show afterwards and when we lingered for a few minutes after the fireworks an usher was all too quick in telling us we had to leave. Despite the harshness of the ushers they will usually let you trade up since there are generally a lot of empty seats (+1). If you have a ticket in the upper deck, however, don't expect to trade up to a lower section (-1). 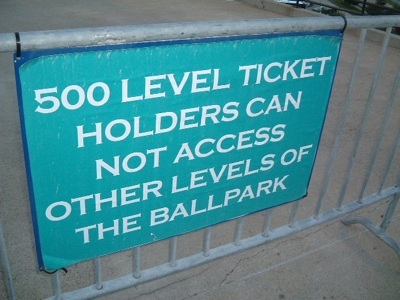 After an incident where some fans attacked Kansas City first base coach Tom Gamboa in 2002 the White Sox instituted a policy of not allowing fans from the upper deck to even enter the concourse of the lower deck. This is a shame as the lower concourse is the best feature of the park. "Take Me Out To The Ballgame" (+1) is played over the loudspeakers at Guaranteed Rate during the 7th inning, and after that the popular music begins once again. The scoreboard used to light up during the song (+1), but other for whatever reason they don't do that anymore (-1). At least they keep the tradition of playing the song, though. The Sox get a bonus point for starting the tradition of Harry Caray singing the song before he moved north to the Cubs (+1). You do not want to look for any restaurants around Guaranteed Rate. Although some claim the area around The Cell has improved it is still pretty empty (-1) even if it is safer (+1). A few restaurants have been added directly next to the park, but your best option is to take your car or the El downtown if you want to have someplace to celebrate after the game.